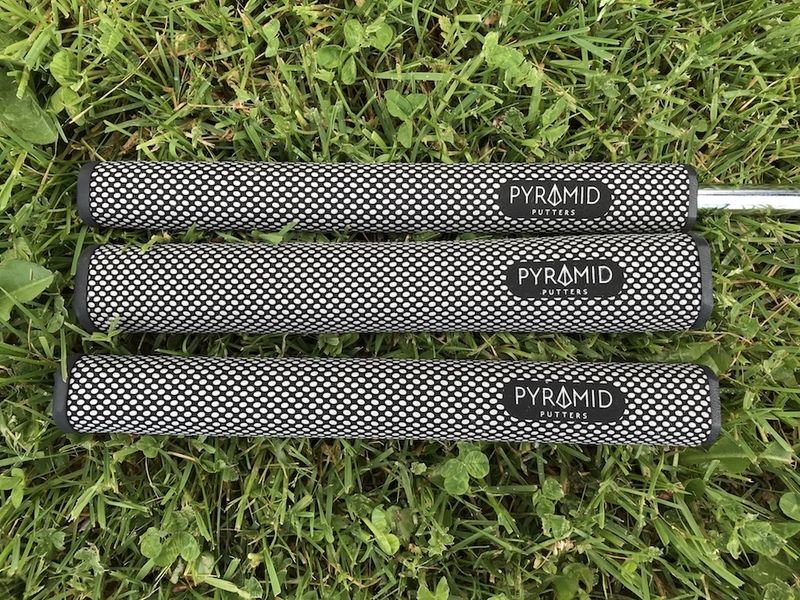 A new player in the clubmaking industry, Pyramid Putters, hits the market with a brand new putter. We test it and let you know if the new tech works. Amongst all the clubs we golfers carry in our bags, the most personalized, or better said the most unique, has to be the putter. Sure, the drivers have added a little color over the past few years and of course there are cavity back irons and blade irons of many types, but for the most part the other thirteen clubs all look relatively the same between manufacturers. The putter on the other hand is unique. Shapes, lengths, forms, and colors can vary wildly. A popular saying amongst many golfers is “I’d putt with a shovel if I could make more putts”. I mean did you ever see the putter Jack Nicklaus used to win the 1986 Masters? Good lord, that thing was ugly. Because golfers will putt with just about anything this leaves the market for putters and putter manufacturers wide open. If you were looking to be a golf equipment start-up breaking in to the market with a putter would be an excellent start. (And we see this every year at the PGA Merchandise Show.) This means when the opportunity to review a putter comes along many of us who’ve been doing reviews for many years are skeptical. 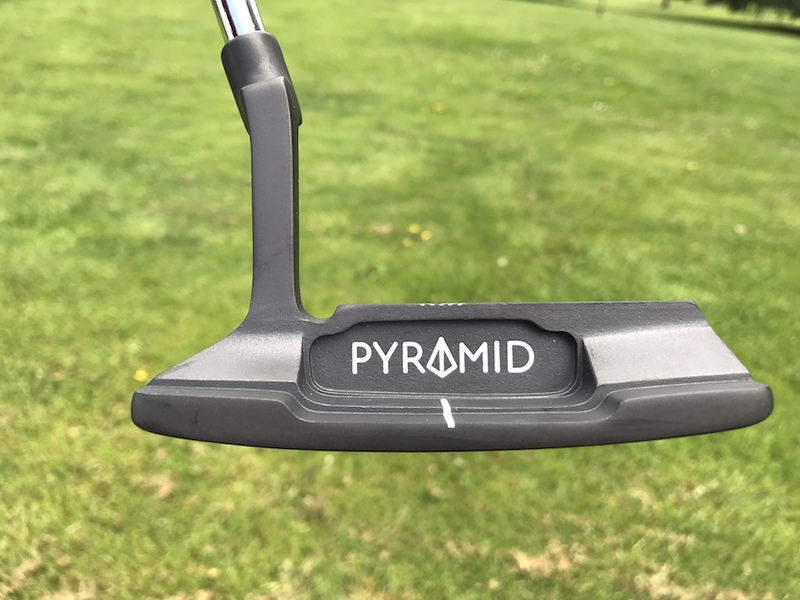 I am one of those folks who would putt with anything if it helped my game, so when the opportunity to review the new Pyramid putters came up I was very intrigued to give it a try. 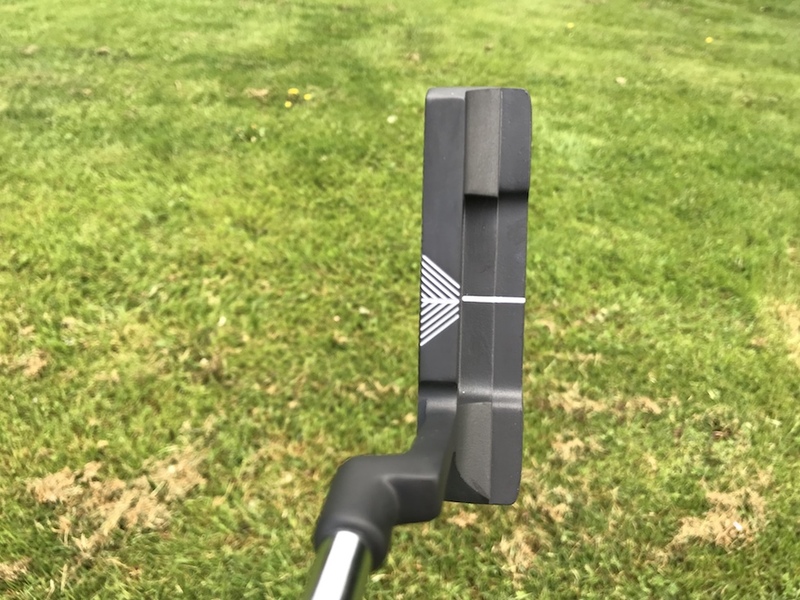 For this review I was give the AZ-1 Blade putter but they also have a mallet version available on their website. As I mentioned above, putter styles can vary greatly. So, when I first got my hands on the Pyramid putter my first thought was, wow, they went pretty traditional with their approach. The blade putter I got was extremely traditional in its style. Very much in the PING Anser style of putter head. That Anser style has been copied so many times that its market share on style alone is probably over fifty percent. Where they decided to take some of the unique flair for their putter was in the color scheme. Now you are probably looking at the pictures and say, what on earth are you talking about? It black. But I’d recommend you take a deeper look at the color scheme they chose. 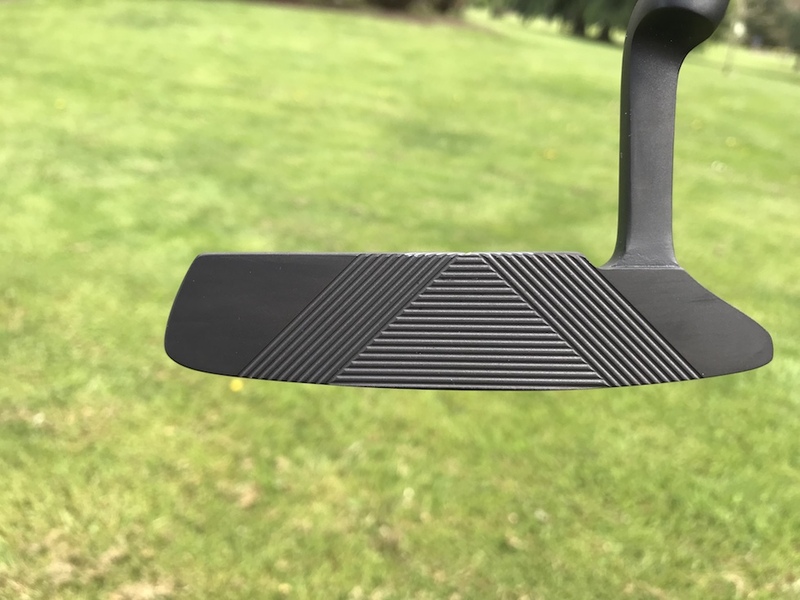 The top of the putter, so the part you look at when you’re using it is matte black. This really helps to eliminate the glare that can pop up when you’re out on the course on a nice day. Then for the bottom of the club they went for the shiny black finish to give the club some pizzazz. The matte top versus the shiny bottom is a great contrast that make the club pop. The bottom also plays host to the majority of the logo markings for the club. The main logo at the center of the bottom of the club is the Pyramid Putters logo. On either side of that main logo are two actual pyramids. They are set next to each other along with the model of the putter the AZ-1 and the phrase Aztec Series. It seems that these pyramids are modeled after the Mayan pyramids and not the Egyptian versions. All of this logo work is done in white in order to create some pop versus the black finish of the club. The back of the putter has another Pyramid logo although this one is without the putters language included. The logo is found in the cavity of the putter and is also done in white to offset the black matte finish. There is no logo or lettering on the bumpers of the club which allows for a clean look for the putter. The top of the club has a very unique feature of having the continuation of the pyramid which is on the face which turns out to be an excellent alignment aid. When the top two pieces of the pyramid come together they form a line which goes nicely with the line that is typically drawn on the back flange of the clubhead. This larger white line is a more traditional alignment aid and goes nicely with the pyramid design. It is certainly one of the more unique design features I’ve seen. The face is also done in the matte finish but the pyramid design set on the face still manages to stand out on the face even though they both are done with matte. 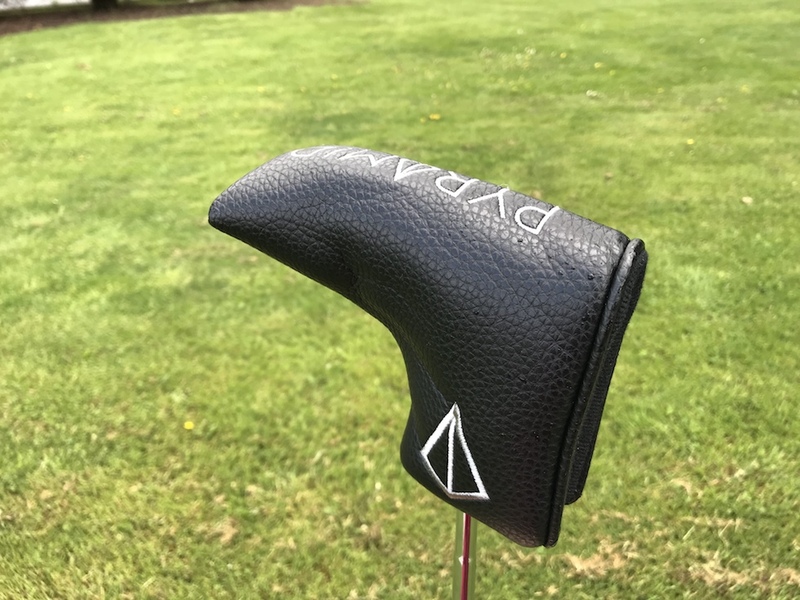 Because golfers don’t spend much time studying the face I won’t drone on here, but overall the design of the club head is both fashionable and useful. The last thing I want to mention about the putter is the grip. While there are some technology pieces of the grip I’ll get into in the technology section below the grip also looks really sharp as well. The main color is black and the black material can only be best described as a suede type of look and feel. It is extremely unique style. The suede however, is covered in small grey dots which are a very tacky plastic. These dots can best be described as “nubs” and are very tacky. I admit to first being turned off by the grip, but after giving it a try I am really starting to like it. The main technology utilized in the Pyramid Putter is not new. The main technology is the grooves that can be found on the face. In the sweetspot or maybe better defined as the center of the club head the grooves are parallel to the ground. This technology was first introduced that I can remember by YES! around 2002 or so. It may have been earlier but that was the first I had seen the technology. The concept then and still now is the grooves help to get the ball rolling faster. On big difference that I have noticed in the Pyramid putter versus the YES models is how the grooves sit on the face of the putter. I can remember the early models of the YES putter the grooves sat above the face of the putter, almost like they were glued onto the face. With the Pyramid putter the grooves appear to be milled into the face of the putter. Personally I like this better because it does not make the face appear to bulge out at address. All putts skid to start out, so the faster you can get the ball rolling the more control the golfer has over the distance. It seems mostly to come down to consistency. The faster the ball gets to end over end the more predictable the distance the ball will travel. In the years since I first saw the YES putter almost all the manufactures have added some kind of grooved putter model. What makes the Pyramid putter unique is not the grooves themselves but rather how they have arranged them. As I mentioned near the sweet spot the grooves are parallel to the ground, but alongside those parallel grooves are grooves set at a 45 degree angle in the shape of a pyramid. Those 45 degree angle grooves according to Pyramid Putters helps with putts that are struck off center. The idea being that those grooves can help to keep a consistent roll even you don’t hit the ball on the sweet spot, which we average golfer tend to do from time to time. 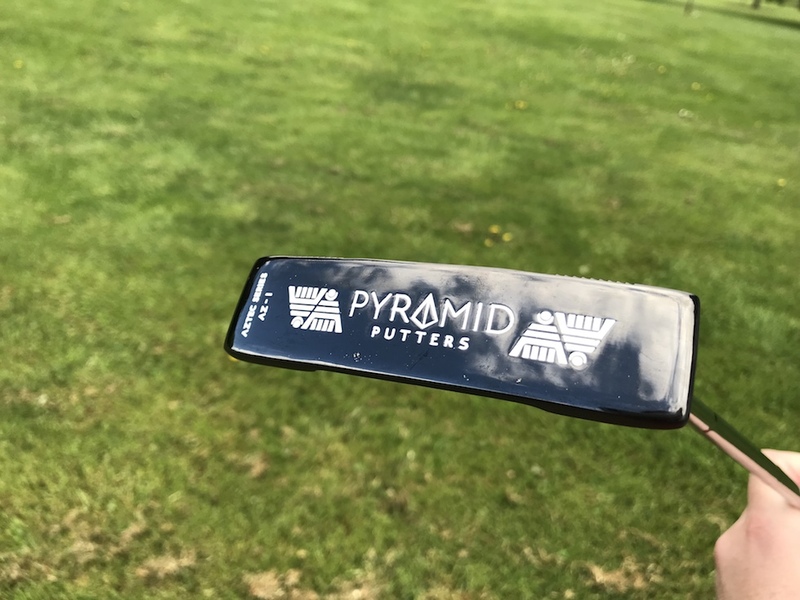 There are other smaller pieces of technology built into the Pyramid putter but for the most part they are relatively small compared to the angled grooves. The other piece of technology I found myself liking was the alignment set but the small pyramid on the top of the putter. 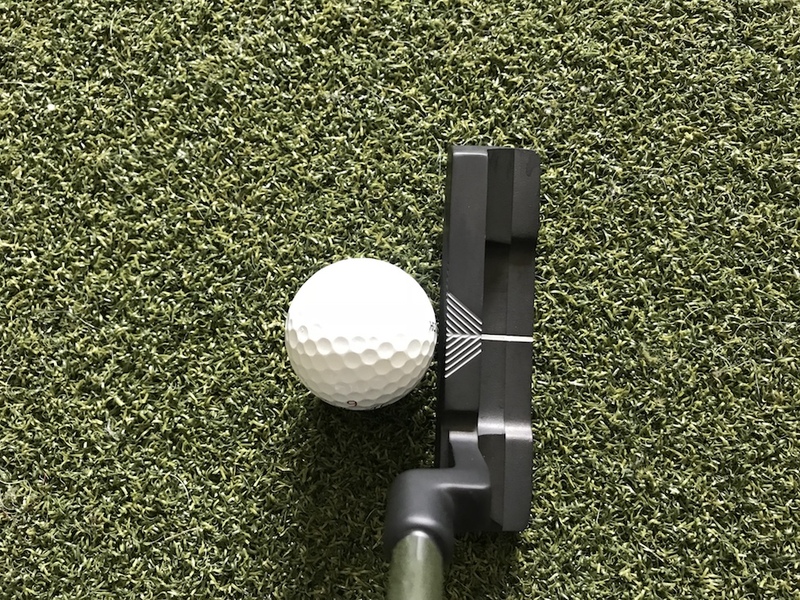 On the Pyramid Putter website they call out the capability to align your head over the ball with the way the smaller pyramid on the top of the putter aligns with the alignment line on the upper bottom part of the putter. They boast that aligning these two elements make it possible to tell if your head is properly aligned over the ball. It is debatable if alignment is technology but it was unique enough of a feature and I liked it enough that I wanted to call it out. The other notable piece of technology was the grip. While again not an overly unique touch the grip that the putter came with was an inverted taper. Meaning the end of the grip was smaller than the beginning. It was a very small taper but noticeable nonetheless. I really liked how this felt in my hand. I didn’t think I would like an inverted taper but I found myself really liking it. 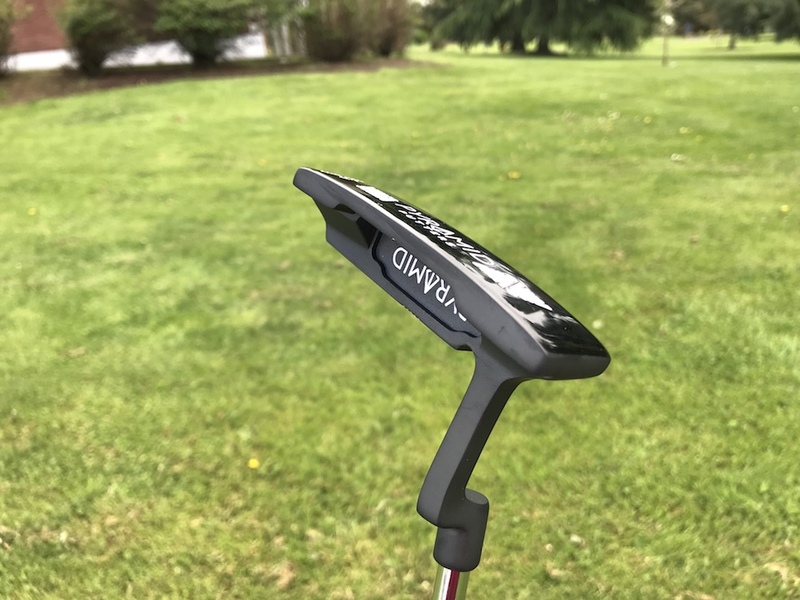 The big question anytime you do a review is, “so did it work?” I can say when I first got the putter I was extremely skeptical. I have done so many reviews over the years that you begin to question how much is really new under the sun. All that said however, I did find myself really liking how this putter performed. The biggest improvement I saw was in my lag putting. I saw immediate gains in how well I was able to keep the ball near the hole while I was lag putting. I also felt very confident on short putts as well because of the pyramid alignment aids that were added. I just felt it was very easy to line up the putter and knock in those three to five footers. I built up quite a confidence with this putter. I cannot say for sure that the angled grooves did anything for me. Because it is a putter it is hard to know for sure where on the face I was hitting the ball to know if the ball was rolling better when hit closer to the toe or heel. That said it is hard to deny how well my lag putting became when using the putter. It stands to reason that because of the length of strokes necessary on longer putts I most likely struck the ball on a couple of those angled grooves and the ball was able to stay on line and roll out to the right distance. To really test this out one should get an Iron Byron putter machine and align the ball on the angled grooves just to see what happens. I didn’t find any study like that on the Pyramid putters website but I imagine it is something they can do for the future. From my personal testing while still skeptical it is hard to argue with the results. The overall feel of the putter is solid but far from the best feeling that I have used. The sound of the ball off the putter face can best be described and a dull thud. I think that the Pyramid team should investigate some methods of improving the acoustics to help with the overall feel. Maybe cutting a sound slot in the face would be a big help. Might add to their manufacturing costs but might make a big improvement to the overall putter. They might also try experimenting with different materials for the putter. Those recommendations are certainly not necessary but are worth considering. The reason they are not necessary is the plain fact that the putter just works. Which is simply the main required functionality the putter needs to have. Breaking into the golf manufacturing world can’t be an easy task. There are enormous brands such as Nike, TaylorMade, Callaway all spending millions of dollars in advertising. Even you have a great technology it is really hard to be heard over the crowd. The easiest way to get a foot initial foot in the door is create a good product in the putter space to get your brand out into the market. This is how Edel has mainly broken into the market but starting with a unique putter fitting, then moving to wedges, and now into iron sets. I think the Pyramid putter is an excellent start or better said kick off into the golf marketplace. It is a very solid product with some cool technology to boot. 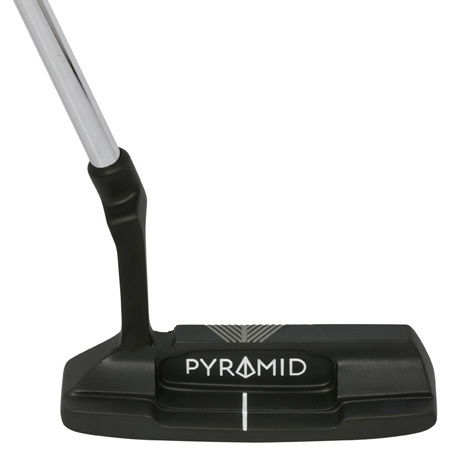 I think if you are a golfer who is out looking for a traditional looking putter that is slightly unique versus what else is out there I highly recommend you give the Pyramid putter a try. I found the putter to be highly functional, along with some keep tech upgrades like a reverse taper grip and the grooves, the putter is a great addition to players of any skill level.